Ticalc.org is the premier site in the TI community. It is not only the place where everybody goes for TI calculator games and programs and likewise where people upload their games and programs, but it is the very face of the TI community itself and having your project or website featured on its front-page news brings with it a high level of prestige and honor. It has been involved in the TI community since 1996, and is the only TI site from that time period that is still actively maintained today. The ticalc.org site has an unparalleled archive of TI calculator games and programs. Due to the fact that it has been operating since 1996, it has collected most of the games and programs that have been released by the TI community for the various TI graphing calculators over the years. However, a lot of the files that have been uploaded to ticalc.org are rather poor quality as the ticalc.org file archivers were often overwhelmed with lots of programs being uploaded and simply let everything through. Its archive of TI-83+ TI-Basic programs, for example, contains close to 100 quadratic solvers. Due to its long run as a website, the site also acted as the main news site for the TI community until 2015. Whether it is a new game, program, computer application, or website, ticalc.org covered many of the important happenings in the TI community over the years. In fact, if your program or website gets features, it is a mark of quality; TI community members even boast about getting their project featured on ticalc.org. Unfortunately, ticalc.org experienced four periods (2002, 2008, 2010 and 2015) where they rarely posted news and by the end of 2010, the website's status as the main source of TI community news started to be called into question, resulting into other community sites taking the lead in informing the TI community about releases and happenings. However, Ticalc.org still remains a very popular source of program downloads and their file archives are still updated on a regular basis. Its mailing lists were also quite popular when they were active from 1997 to 2002, with lots of user activity and good discussion going on at any one time. Ticalc.org has had some of the TI community's most distinguished programmers as staff members over the years, most notably Ahmed El-Helw, David Ellsworth, Kirk Meyer, Michael Vincent, and Corey Taylor. In addition, several of its members have been involved with other TI sites and programming groups including Nikky Southerland (CalcGames), Morgan Davies (CalcGames), Nathan Haines (Stuntworks), Bryan Rabeler (The Fargo Archive), Patrick Stone (Suicidal Psycho Software), and Eric Sun (Dimension-TI). Ticalc.org is the longest running TI calculator site, and has the largest collection of games, programs, tutorials, etc. in the TI community. Simply put, it is the first stop you make when visiting the TI community. It has hosted several prominent TI calculator sites, including Void Productions, Icarus Productions, The Doors Team, TI-Chess Team, and SiCoDe Software. It also popularized giving out awards to the best programs that were released, having the TI community vote on which programs from the archives they thought were best. The Program of the Year (POTY) award is still ongoing, but the Program of the Week (POTW) and Program of the Month (POTM) awards have been discontinued due to issues with fairness and impartiality with the program selection, as well as because of insufficient number of featured programs being released by the community. Ticalc.org has used the URL http://www.ticalc.org since its very beginning. Isaac Salpeter bought the original domain name and provided the hosting through his Florida State University account. The hosting has changed, however, as Magnus Hagander hosted the site on his own server in Sweden and then moved to a new server located in Germany in 2010. We host only TI-related web sites of two kinds. One kind is software "companies" who develop games or programs for TI calculators and have released games or programs in the past. The other type is informational sites with content such as tutorials or hardware information. It is our intention not to host "competing" sites (for example, those with separate file archives). We only host 'established sites', meaning that the site has to be up and running before you get hosted, to make sure it's an active site. We provide reliable, advertising-free web space and exposure to quality TI calculator web sites that have something unique to offer. Most often we host sites maintained by programmers and groups of programmers or sites containing information that complements what we already provide. Check them out! We're proud to host some of the best TI resources you'll find on the web. 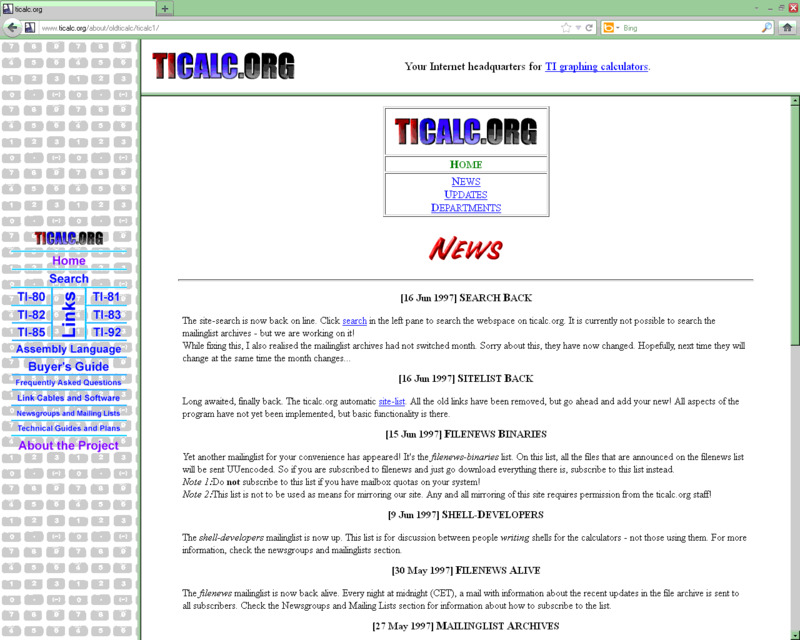 Note: Some of the sites later switched hosting to Dimension-TI (calc.org). In particular, Void Productions, Symbulator, and Destination Software; David Hall of SiCoDe Software also founded a parody TI programming group called PsychoCorp that used Dimension-TI for hosting. The ticalc.org project is a collaborative effort geared toward the numerous fans of Texas Instruments' Graphing Calculators. Derived from several large Internet resources, ticalc.org aims to act as a headquarters for all available information on the subject. As there are presently a high number of existing Web and FTP sites focusing on the calculators, many of questionable necessity and originality, the project is an attempt to make available at one location as much valid and useful information as possible. While the site has the potential to become sophisticated in terms of Web technology, the focus is more on compatibility, ease of use, and the best possible organization of information to satisfy the broadest audience possible. All of the content has been reorganized and pooled into ticalc.org, and the maintainers of these sites now collaborate to bring you this server. TIGCM: What were the beginnings of ticalc.org like? Magnus: Back then, there were a couple of big sites operating. 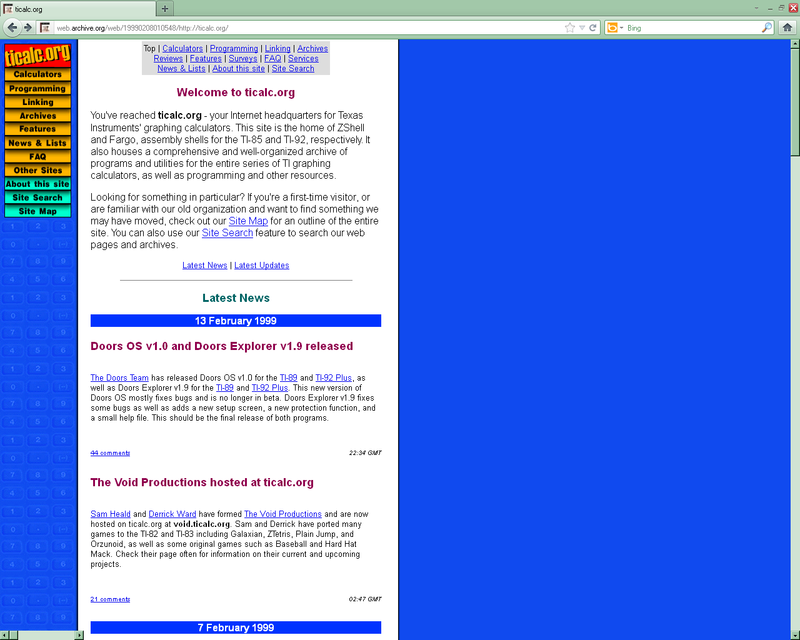 There was "The Unofficial TI Calculator Home Page" (still available in our History section) by Chris, The Official ZShell Home Page (the FAQ is in our History section, the site itself is not) by Henrik and the ZShell Fan Page by me (sadly, not available in our history section). There was also a huge list of smaller TI sites that was maintained by Amitai Schlair. One day, those of us who worked those sites, as well as some other major players in the TI arena (such as Dan E) got a mail from this guy, Isaac Salpeter (I had already been working with Isaac on some other TI related projects - he wasn't completely unknown), asking what we thought about joining all these sites together into a single "complete" site. We were all very interested, and Isaac ended up registering the domain name and setting up a Linux server running from his room at Florida State University. A couple of months later, ticalc.org was opened up (It took a lot of work to fix up the site well - and everything was done manually back then). TIGCM: When did you decide that a site like TICALC.ORG needed to be started? Isaac: Around the time of TINSOL (TI Net Sites On-Line). I realized that TI hobby pages were proliferating like mad. I watched developers plead for people to think twice before setting up a new page, heard complaints from users unsure where to find the latest versions of programs, and realized the ideal solution would be a single site to find everything. TIGCM: What prompted you to create TICALC.ORG when you already had an excellent "Unofficial TI Calculator Home Page?" Chris: The site is more than what the UnPage was. It's more official in the sense that it's the headquarters for just about everything - ZShell, Connect-85, and soon-to-be Fargo. Isaac saw the opportunity and suggested it to the major page maintainers several months earlier, and we did the best we could by integrating all of our content and doing away with individual credit. TIGCM: Who makes up the TICALC.ORG project? How many people are involved? Isaac: The primary project members are Chris Dornfeld, Magnus Hagander, Henrik Edlund, and I. Chris, as I mentioned, is the former maintainer of the UnPage and is the primary designer of the pages on ticalc.org. Magnus, who many readers may know as the primary developer of Zshell 4.0, helps maintain the server, drawing on his own experience as a professional system administrator. Henrik, who ran the old Official Zshell Home Page is now the primary FAQ writer, and assists in keeping the site updated. I initially rounded up the team members and provide the hardware and network connectivity, as well as update the site and other assorted tasks entailed in maintaining a living server. We're also working loosely with David Ellsworth (developer of Fargo), Dan Eble and Rob Taylor (more ZShell developers), and Amitai Schlair (former TI Net Sites maintainer), who is presently off-line. Bryan Rabeler wrote the ticalc.org Newsletter until Kirk Meyer took it over after Bryan was fired from the site. Chris Dornfeld wrote the first article for ticalc.org on July 25, 1997. A particular handful of computer enthusiasts has contributed hundreds of hours of programming and web site maintenance and thousands of dollars' worth of computer equipment to operate a variety of public Internet services. An unusual scenario? Hardly. What's remarkable about this situation is that the individuals in question have donated their time and hardware for free. Perhaps even more of note is the source of this elaborate undertaking: calculators. I'm talking, of course, about the extended staff of the ticalc.org project. At this point, many ordinary people are all arriving at the same, logical question: Why? As a member of this group, I'm in a position to give my feelings on why this site exists and what keeps us going. First I'd like to dispel any beliefs that we're somehow funded by Texas Instruments or bribed to keep this site going. (At this point, many ordinary people have just arrived at a complete loss for hypotheses on the big question.) As our top-level domain implies, we are not in this for profit. We do not offer advertising. We also do not yield any spectacular fame from the project. What would possibly possess ordinary people to put all this together? I'll do my best to explain. There are a great myriad of TI-calculator-related sites online. Everyone with a calculator and an AOL account, it seems, feels obligated to slap together some redundant programs and graphics and launch their own Average Joe's TI-8x Page. Where do we get off distinguishing ourselves from the crowd? Well, we are different. We like to think we offer a degree of quality control to this chaos. We fancy that our pool of skills is more capable than that of any other web site staff to meet the challenge of running the most complete TI web site. And, encouragingly, we've proven this in the past. Our dedicated server gave us the opportunity to host our own domain name. Such an investment is immediately a sign that we're serious enough about what we're doing. Our server lets us offer services not everyone else can: anonymous FTP, mailing lists, a search engine, and more. We have taken advantage of the ability to use programming to make our web site more functional. The end product is evidence that we, ourselves, have the know-how to put it all together. That's great, right? Why don't we pool our skills toward something more useful, like another Quake site? I answer this by saying that I like to think we're making lots of people happy. I like to think this because I see visits from dozens of countries in our web server logs, because I sense the excitement throughout the community of TI enthusiasts when the latest breakthrough is made, and because I've seen how unhappy many people became when they could no longer take our web site's consistency for granted. About this last part I am not proud, and admittedly our problems have often extended beyond hardware flukes into a lack of motivation on our parts. But as I watch this site turn into the resource I wish had existed when I first turned to the Internet in search of expanding my graphing calculator's usefulness, the more I feel it is worth it. Countless high schoolers in the United States buy TI graphing calculators each year on recommendation of their math teachers. And as the Internet's popularity grows, many of them are discovering that there's much more to be done with their investments than finding the slopes of parabolas. It's about making the most of an investment and unlocking the full potential of a surprisingly complex device. As people continue to seek these ends, I'm happy to be a part of uniting them with the tools and information they need. That's the satisfaction of putting in my effort and asking nothing in return.